Due to the nature of chalk, pastel portraits are usually painted just under life-size or larger, in order to capture sufficient detail. I use a high quality, acid free, artist's pastel paper. 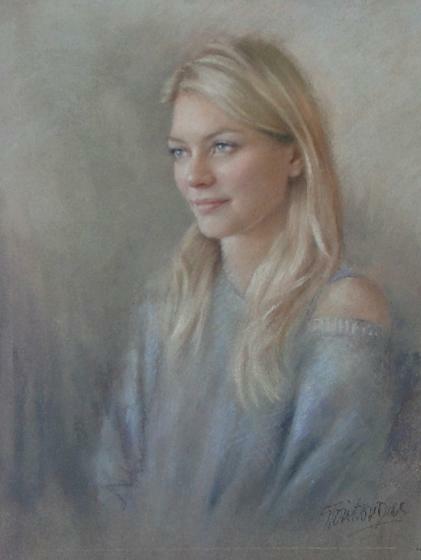 Normally two to three sittings are required for a pastel portrait, though a preliminary sketch can take less than one hour (see children's quick portraits). Group portraits consist of one or more portraits, and range from a group of head portraits to family groups. Portraits in oil are painted on canvas or high quality acid free gessoed board. Small or large, they may require up to six sittings for a portrait when painted entirely from life, but when this isn't possible it's preferable to have at least the first and last sittings from life, most of the portrait being completed from 'photos.